I have a few updates and corrections to share for the first edition of Modern Log Cabin Quilting (published March 2011) – please check this page or let me know if you see anything you have questions about! 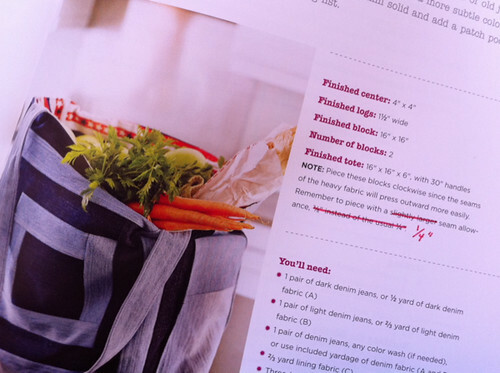 The Market Tote project (page 141-144) has an error on the first page when indicating seam allowance. 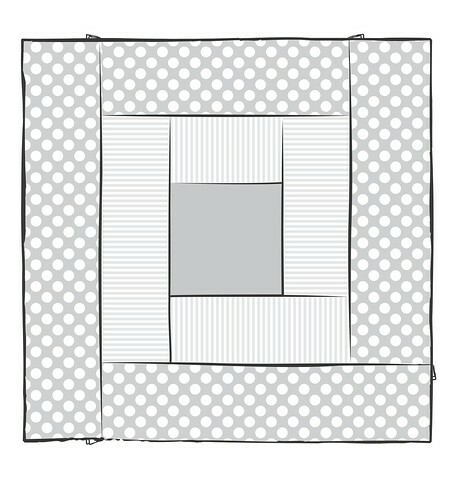 It asks for a 3/8″ seam allowance, but you should use a 1/4″ seam allowance instead (see photo above). Earlier in the book, on page 31, I had recommended wider seam allowances for certain fabrics (like denim) but that advice was primarily meant for large-scale piecing and quilts (like the Winter Woolens and Housetop Quilts, for example). The incorrect, larger seam allowance ended up in the note starting the instructions for the Market Tote, which is a smaller project pieced more closely. I really apologize for the error. If you have pieced your Market Tote blocks with the 3/8″ seam allowance, you can certainly still make a sturdy tote bag with them, but it will be on a smaller scale (about 14″ instead of 16″ across) and you’ll need to trim your lining, sides and bottom down to match. Please comment or email me if you need more details and I’d be happy to respond or update here. 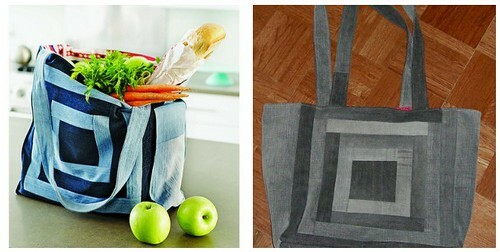 Thank you to Mary for contacting me about it and sharing her photos of her lovely finished smaller Market Tote in grays and blacks (on the right, above) in the book flickr pool. 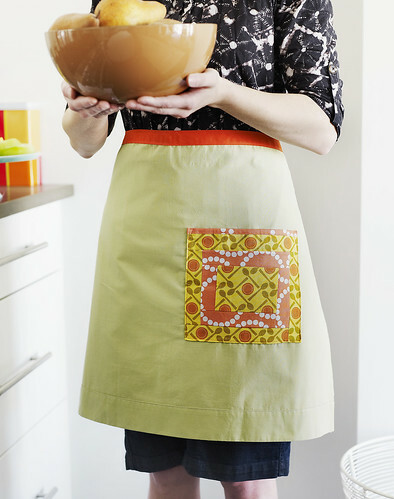 The Block Pocket Apron (page 116-120) has two number typos in the first edition of the book, which are corrected in a brand-new downloadable PDF version of the pattern. You’ll use a 3.5” x 4.5” (not 3” x 4” as it’s mentioned once on page 117) piece of pattern paper for spotlighting centers, and for the first tier of logs (fabric B) you’ll cut a 1.5” x 21” (not 1.5” x 18” as it’s mentioned in the Cutting Key on page 118) strip of Fabric B. I apologize for the errors, and I’m glad to have the chance to share the corrections here and in the updated pattern PDF (just click to download it). I also wanted to show some examples (above) of the 2″-wide bias tape I recommend for the waist sash so there’s no confusion there either. 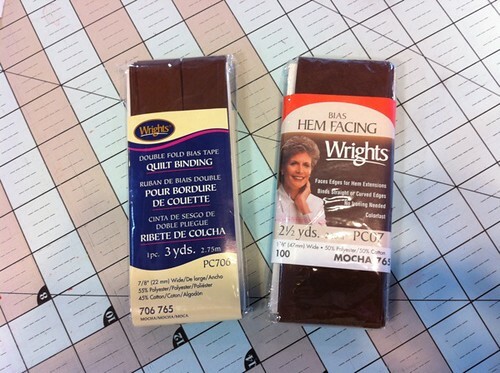 Here are two types you can use, labeled hem facing and quilt binding. Or you can use a 2″ Clover bias tape maker for a handmade version! In the written instructions to piece your first Picture Frames block (pages 28-30), the final illustration of the front of the finished two-tier block was cropped a bit on two sides instead of shown in full, so I wanted to share the complete image here for reference. Each of the 25 projects, from the smallest coaster to the most complicated quilt, is rated between one and five spools of thread for difficulty. Here’s the chart on page 9 that explains it all! Four projects were inadvertently rated with the wrong number of spools (5) – here they are with the correct difficulty ratings! I will add a few fun extras to go with projects soon, along with any needed corrections here – thank you for any feedback on my book and projects. i just received your book and am totally in love with it! Great work and can’t wait to get started! Thank you so much, I’m so happy you’re enjoying it! Hi Nancy, I just got back from out of town and saw your comment. The Favorite Fabrics bag was designed by my friend Daniela Caine, so I’ll email you and put you in touch with her too for help with it. Thanks and I’ll update this page with any helpful info! Hi, I won your book in a giveaway when it was first published, but it wasn’t until this week that I had the opportunity to try out one of the projects! I was given several pairs of grey and black jeans to repurpose, and I thought the Market Tote would be perfect for a holiday gift. As I started sewing the last “logs” on the blocks, I took a measurement–14 inches, not the 16 inches printed in the book. I did use 3/8-inch seams, and after some easy counting realized that the larger seams must not have been taken into account when the widths of the strips were recorded. I’m going to trim all my 16-inch measurements down to 14 inches, and I don’t think it will make much difference to the recipient, but I wanted you to know so others could be made aware, or you could verify whether or not my results were a fluke. I’ll post a pic to your flickr pool when I’m done–those greys and blacks do look fabulous! Thanks!